THE BEAUTY OF PAPER: Magnolia-licious Challenge "Winter Fun With Doohickey Dies"
Magnolia-licious Challenge "Winter Fun With Doohickey Dies"
Hello my friends and new visitors, welcome to my blog! 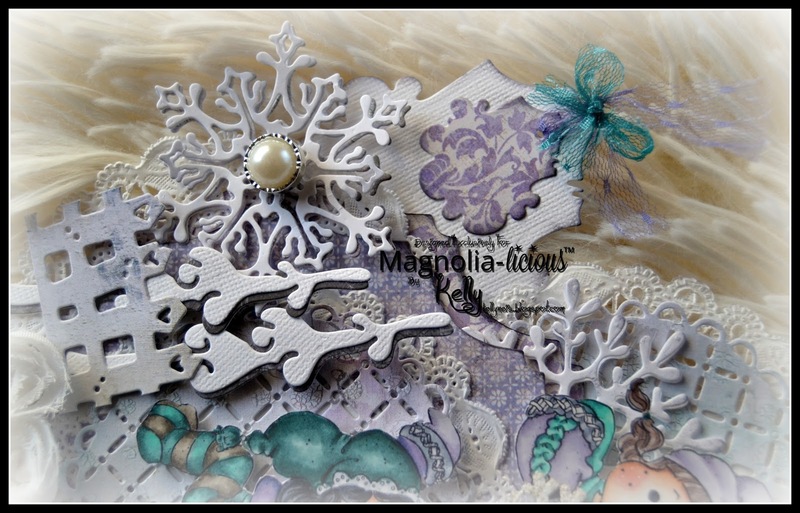 Magnolia-licious, "Winter Fun with Doohickey Dies" . I used "Pixie Tilda" climbing the snowball and "Tilda with Lovikka Mittens" who is waiting above for Pixie Tilda to get to the top. I made my snow ball using the doohickey die Lace Coaster and one coaster is behind Tilda with Lovikka mittens. The girls are colored in Copics and are mounted with dimensional glue dots. Here are some dies all from Magnolia, my papers are from Maja Design. Here is another view, there is a lot of dimension on this card. 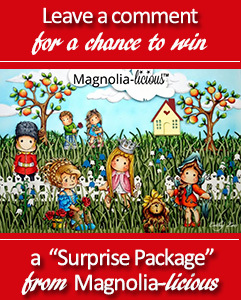 I hope you enter our challenge as the prize is awesome! Thank you for your lovely comments today and have a wonderful week! Oh fabulous creation, superb scene ! I love the scene you have created Kelly ! Fabulus design and coloring . This is fabulous Kelly. The images are gorgeous and I love the design and embellishments. Beautifully coloured with a beautiful colour scheme. Kelly you did an amazing job! Love the design and all of the gorgeous details. Your coloring is beautiful too! Keep up the fantastic work! Absolutely, gorgeous my friend! Love the color palette you chose and all this yummy dies. The images are perfect for your layout. You make me smile from ear to ear and now my face hurts!! This card makes me so happy. It's full of wonderful elements to find and enjoy. Beautifully crafted Kelly! Oh, how cute is that... I do hope she makes it up the card safely!! Gorgeous colours and colouring - a really spectacular design, Kelly.